I had intended to move her page, not because she has moved…….. but just to make room for History/Stories and Legends. 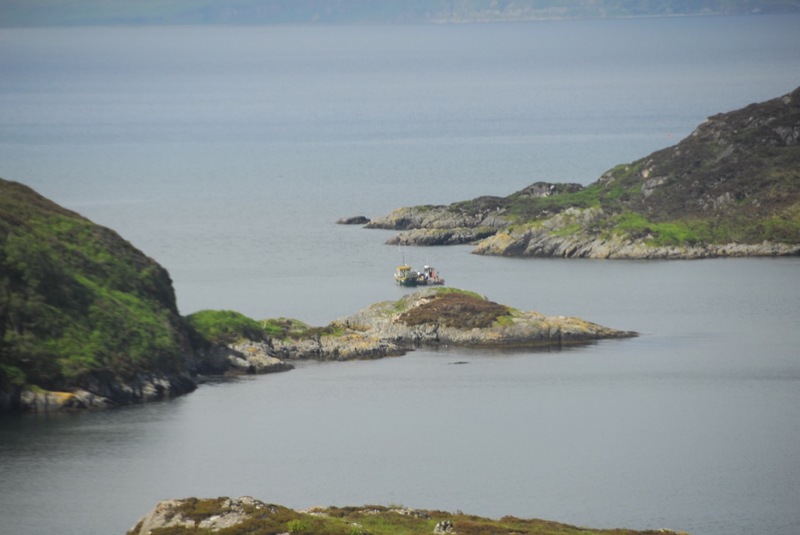 Claire has been in touch, missing her Island but I’m sure happy to be back in Applecross. She is still trying to raise a wee bit more, I think the donation link will be open for two months after she has left Rona, maybe more. So if you can please give generously. Many thanks. This was the story last night as we were heading up to the cabin to watch a movie, summer time having movies with the stove on!!!!!! Claire’s Last Night Under Canvas, Vile!!!!! Yes there were yachts in, there should be it is the height of summer after all. But at 7.30pm last night it could have been a winters night, apart from the swarms of midgies. I spoke to Claire on the VHF radio but did not hang about as it was wet, midgie and the movie was under way. 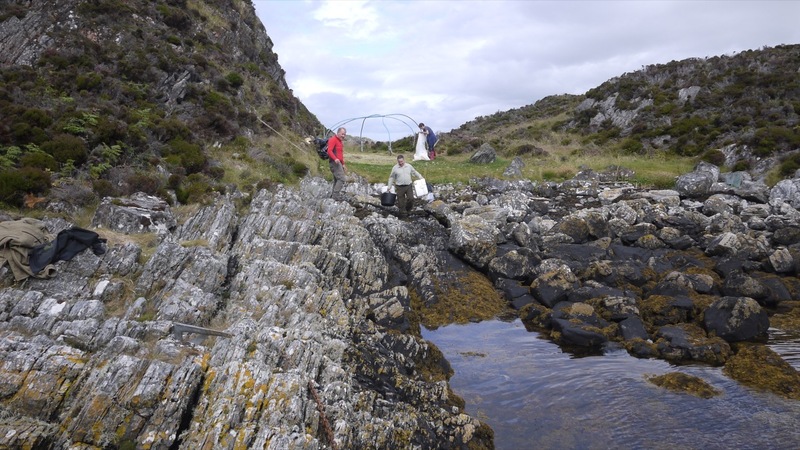 By the time we got away this morning and out to Eilean Garbh, Claire had her tent down, the site all ready for a final tidy then loading. It was a better day for sure. 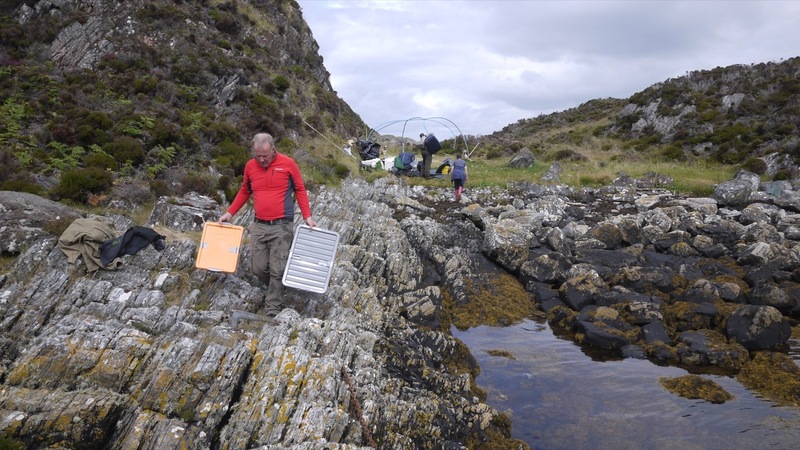 With the help of Wallace and Mike we quickly loaded, the tide was just at the top so there was a bit of a rush. I could not remember all of the stuff going onto the Island but it must have, it looked like everything but the kitchen sink. As usual we provided plenty entertainment for the departing yachties who crept past watching us intently through their binoculars. 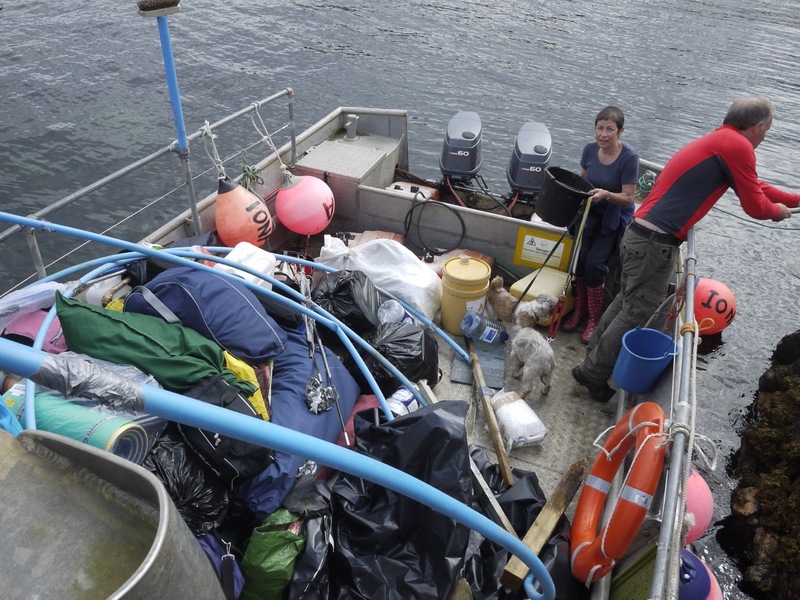 There were a few bags of plastic empty drums, bits and pieces Claire had found on her walks. 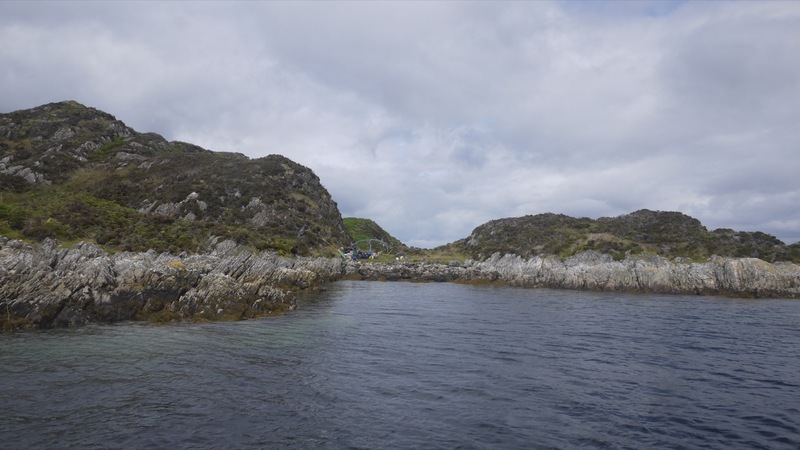 We got away and put Claire ashore on the pontoon ten minutes later, we left half her things on the pontoon under a cover waiting for Ali from Applecross who is coming tomorrow to pick her up. The rest we put up to the bunkhouse where she is going to spend her first night ashore. She had not slept a wink the previous night and was going to have a sleep, it is now 6.30pm and we have not seen her since!!! Yes, it is raining again. Spoke to Claire last night and for the first time she sounded a wee bit despondent, no wonder. She has been battered by gale after gale out there alone on her rock. Yesterday was just about the worst yet with 40 +mph and gusting. She reports that the tent was flattened on several occasions but surprisingly the temporary poles have stood up and the tent bounces back. 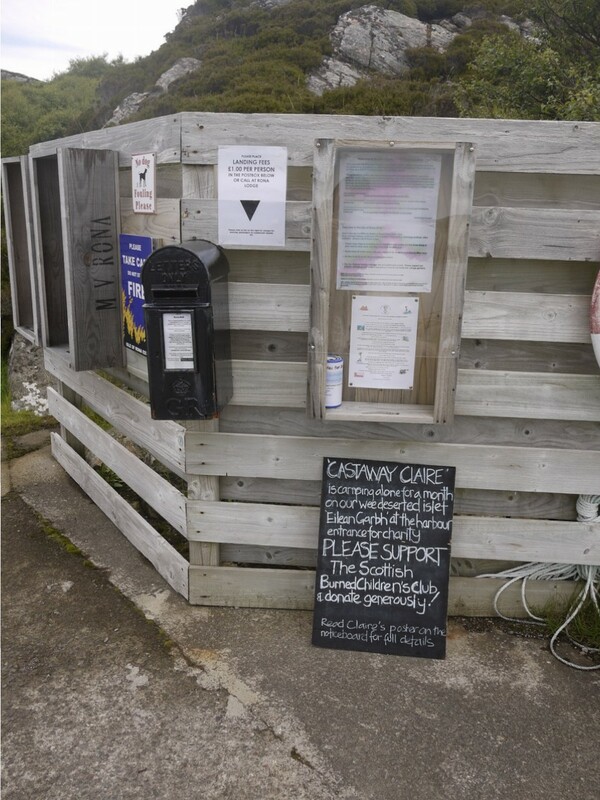 The rain has been relentless so I think it was with a sigh of relief that I told her I had been in touch with Ali from Applecross (Applecross Life) and he was geared up to come over, weather permitting Thursday or Friday. The plan is to go out early tomorrow and get her camp down, onto the boat and back to our pontoon. I guess she will be happy to have lunch made for her and to get a shower. If Ali does not come she can have the bunkhouse for the night. Then back to the new normal. I wonder what effect this months stay will have had on Claire, we are looking forward to hearing more. Although we got out on the boat on Sunday, we have not been able to get off the pontoon since, so no photos. Not even fishermen coming into the bay to keep Claire amused. 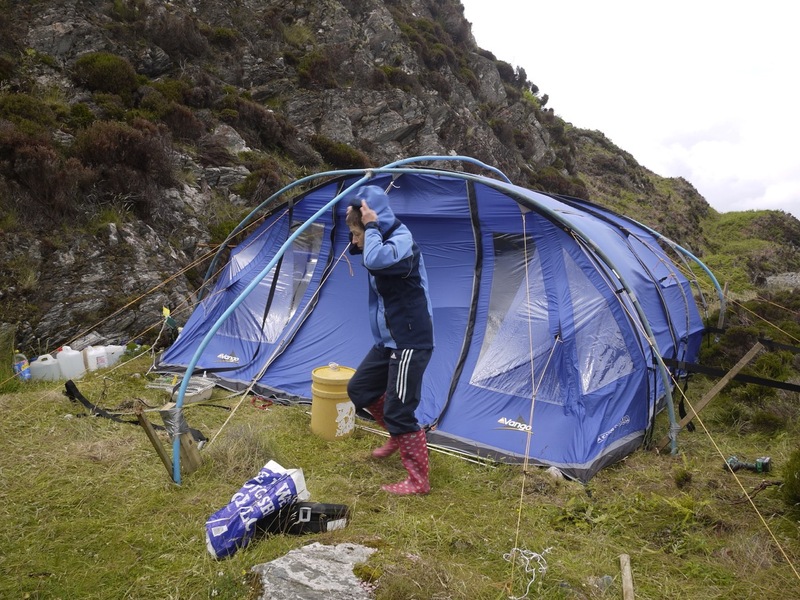 Vango the tent manufacturers have at last responded offering a set of poles, possibly a bit late. But we will suggest a donation to Claire’s Charity, we will see. As I write the forecast continues to give strong winds and rain. This has had to have been the worst July month for decades and no sign of any let up either. Claire is convinced the sun will come out on Friday and it will stay calm for the rest of what is left of the summer. Friday morning and it is grim here, cold, wet, (very wet) and windy. L has just remarked that Claire has not had one single calm day (24 hours) on Rona this July. Quite the worst summer we have ever had on Rona and according to older Skye folk, the worst summer ever. So it is a very stoic and calm Claire I saw last night when I delivered her mail, papers and Green Ginger Wine to keep out the cold (she assures me). This morning it has poured rain on and off for the last 6 hours, there is no cry for help so we hope she is ok. I did email Vango about their tent and it’s (let’s say) design faults but they are very busy just now (wonder why) and will get back to us in the next ten days, which, by that time Claire will be long gone. I’ve just checked the weeks forecast ahead and it is not a pretty picture, SW winds as low pressure after low pressure comes flowing in. A picture more akin to winter time rather than summer, bet this year anything is possible. 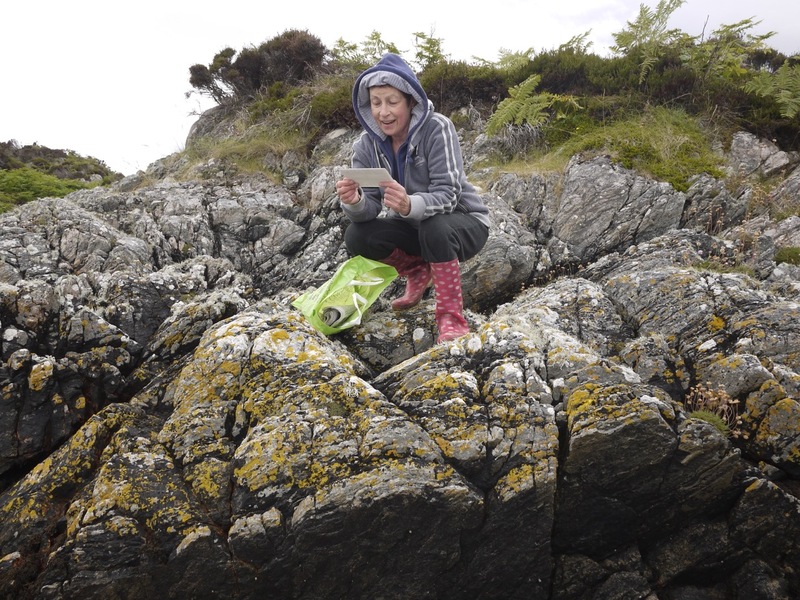 Claire said last night that she had not felt the days long or the time long on the Island, in fat despite the weather she was going to miss her new abode. 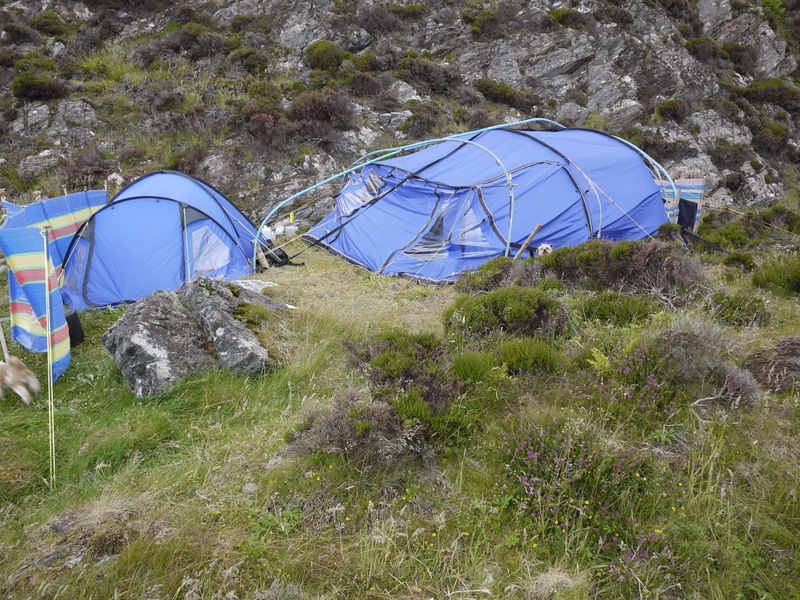 We will probably get her camp down next Thursday as planned, we have Mike and Wallace here next week so we will get her gear up to the Bunkhouse and she can have a night in there to get sorted out before going to either Applecross if possible or with our ferry to Portree on Saturday. Either way we will make it happen. We will for sure miss the ‘Castaway’ but hopefully the result of Claire’s stay will mean a better more supportive time for the work that the Scottish Burned Children’s Charity does. Been a while since we had an update, I have been out to see Claire during the week (as we were passing, going fishing), there was not much to report in better weather, the whole experience had been much better for her. Last night Sunday we took a run out. I had got my Sunday Papers on the day which is always good (we usually get them 1 week later) so I had the novelty of reading a Sunday paper on the day it was produced. So we thought Claire might like to read what was happening off her Island. 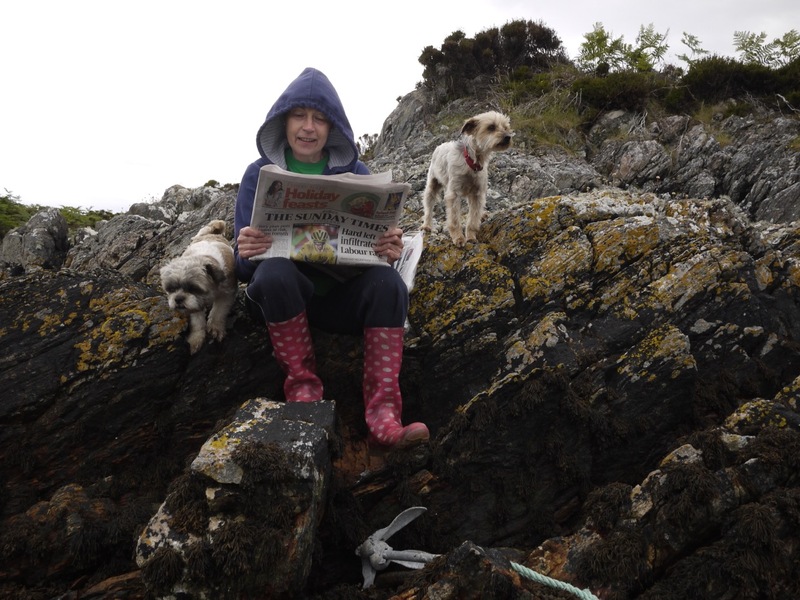 She has the radio for sure but was pleased to get a collection of Free Press, Ross-Shire Journal and Times. Plus a couple of fresh apples and some home made oatcakes. 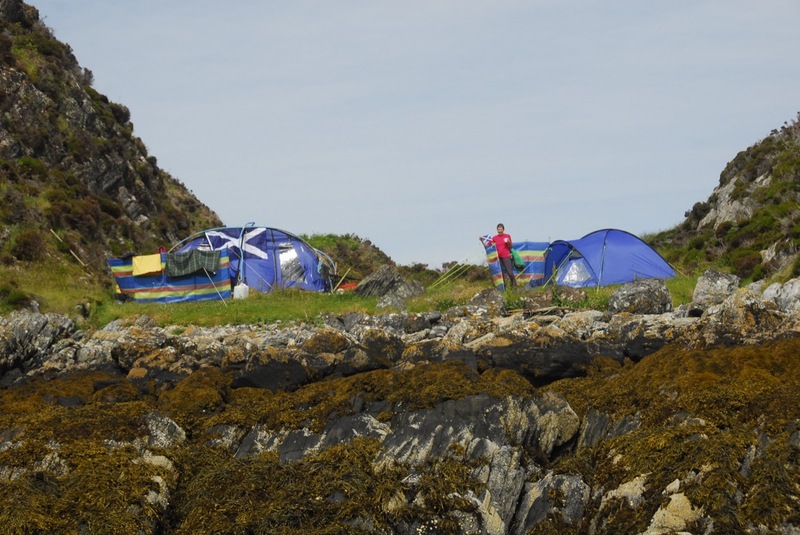 She had been busy re-organising her camp which was not a bad job in the good weather. She had been enjoying the weather, the views and the sunsets. That day she had had a good walk (although the Island is very small) through the bracken and rocks, exploring here and there. With lots of boats in and out she had been having a bit of fun with her ‘blow up flags/hands’. What the ‘yachties’ were thinking we don’t know but at least she was having a laugh. So last night, Claire was off to read the papers and to look forward to completing her third week and the thought that she is almost there. Bruised and Battered!! I went out to see Claire tonight with some fresh water and writing paper (she forgot and she has everything bar the kitchen sink!!!). The scene that came upon was not what I had left yesterday morning. 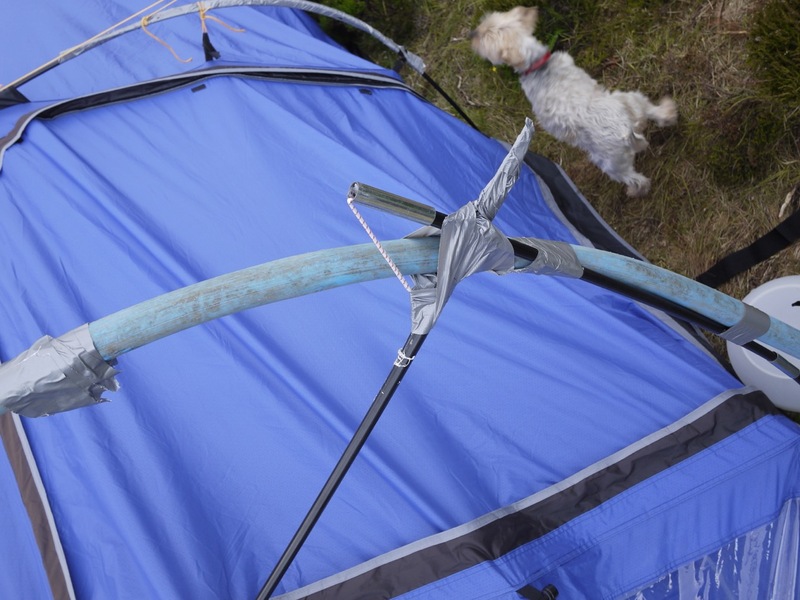 Once again the poles took the damage and without poles, you cannot really hold a tent up, far less protect it against the elements. However, Claire was amazingly upbeat, she told me to tell her family, friends and the Scottish Burned Children’s Charity ‘not to worry, she is very ok’ and the camp site is still comfortable. In fact she is enjoying herself very much. She carried out repairs and tied it down, a little lower ‘again’ but quite secure and still amazingly dry. So, nothing much I could do but leave her to it. She may shift her tent on Friday/Saturday when we are promised calmer weather and I will go out before then to collect her mail. She is still enjoying the peace and quiet, the views but not the weather and can hardly believe that this is the summer. 40+ knots of wind during the early morning when nothing like that was forecast. Tonight it is much the same and yet again it has started raining. Fingers crossed that Claire gets a quiet night. Nothing but the weather to report. Claire continues to get through her challenge, the yachts now know she is there so she is getting plenty waves and shouts as they pass. We are in touch daily and get an update at 9pm via the VHF. She could just do with some sunshine at the half way stage of her stay. The forecast this weekend was awful but she has got through that with no damage apart from being tired holding the poles during the worst of the wind. Fortunately she had South West wind last night and it was dry so I guess she will have had a good nights sleep. She was mentioning that it was quite cold for July and I see we are going to get North wind this week, so it will probably remain in the low teens. She does not seem to be bored as there is always something to do around the camp and there have been no requests for emergency supplies so that is good. Maybe in a few days things will be getting tight and we can offer some fresh things. We had a good chat last night and (they seem to be getting a wee bit longer!!!!!) and she was delighted to hear her tin was filling up on the pier ( slowly, but that is because of a lack of visitors and poor weather). 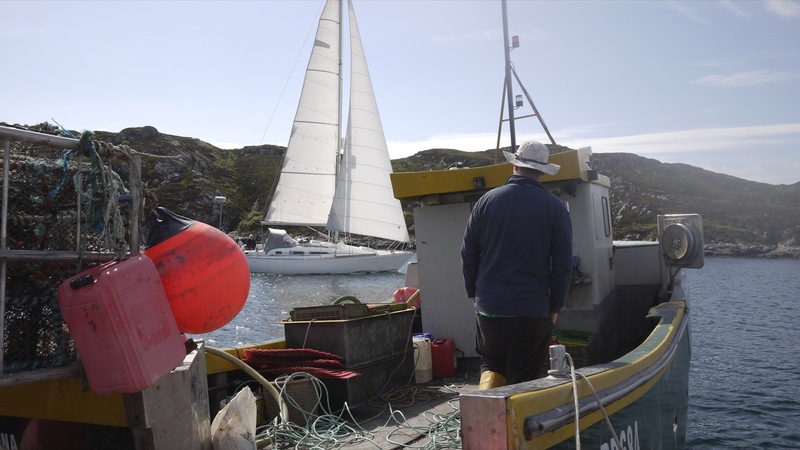 We had a couple of cheques to the Lodge for her and thanks to the visiting yachts for that (Peter in Gairloch). Much appreciated. So here we are Sunday afternoon, calm but a wee breeze to keep the midge away. Hopefully we can get out tomorrow to say hello and this time I promise not to take a picture of her in her Jim Jams!!! After a week of trying to get a sign together we finally got a sign up to accompany the ‘wee’ poster. It works, the tin is filling up and a few notes handed in here at the Lodge, that is really great and Claire is very thankful for the support. Claire was enjoying a post breakfast cuppa when we called this morning and was delighted to receive a day old Press and Journal with news of her challenge. She was less impressed to hear about the gale coming. Her guard dog came down to the shore to say hello, don’t know if he was wanting to get off or not? 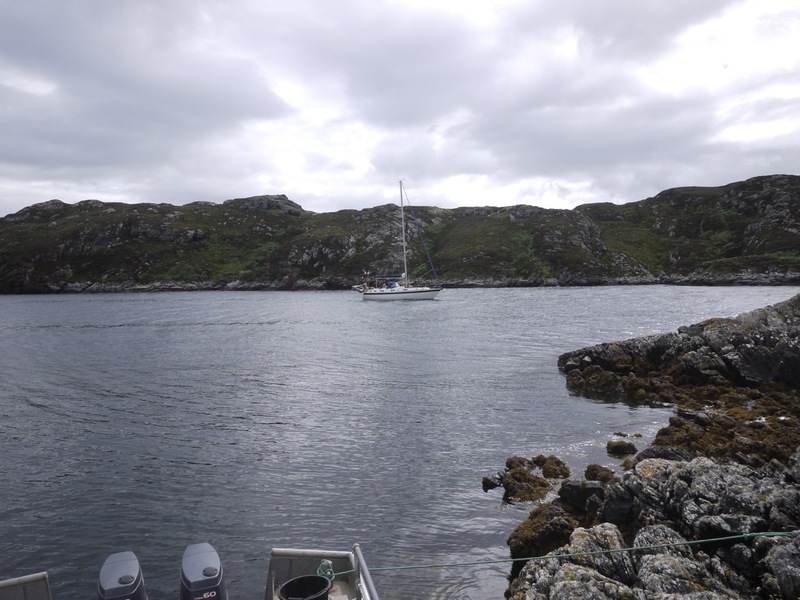 There was not much time for a chat to-day as the tide was dropping but she did report a busy day of to-ing and fro-ing of the yachts and various other boats. Probably the busiest day of the year here. 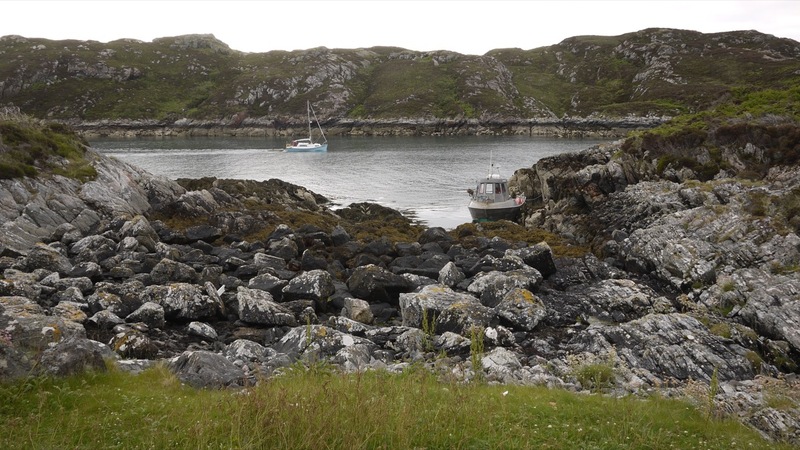 What she is really enjoying is the wildlife (such as it is) and reports shoals of fish coming into the harbour early in the morning, mackerel probably. Lots of splashing and noisy. All in all she is doing fine and not counting the days at all. 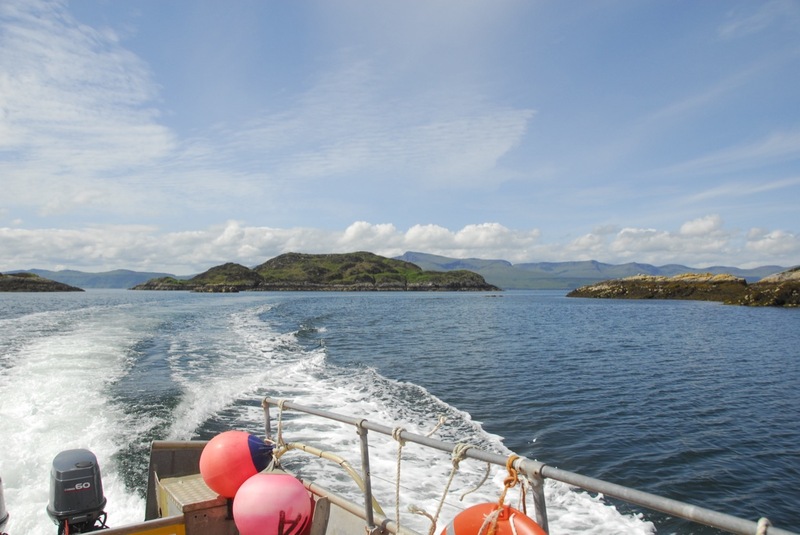 Eilean Garbh Enjoying Sun At Last. Sunday 12th: Day 7, mostly bad weather. We are now in communication through the VHF although the system was playing up last night, we will check it out later. The wind and rain continues to batter Claire and her camp. It is now out of the east and wet. 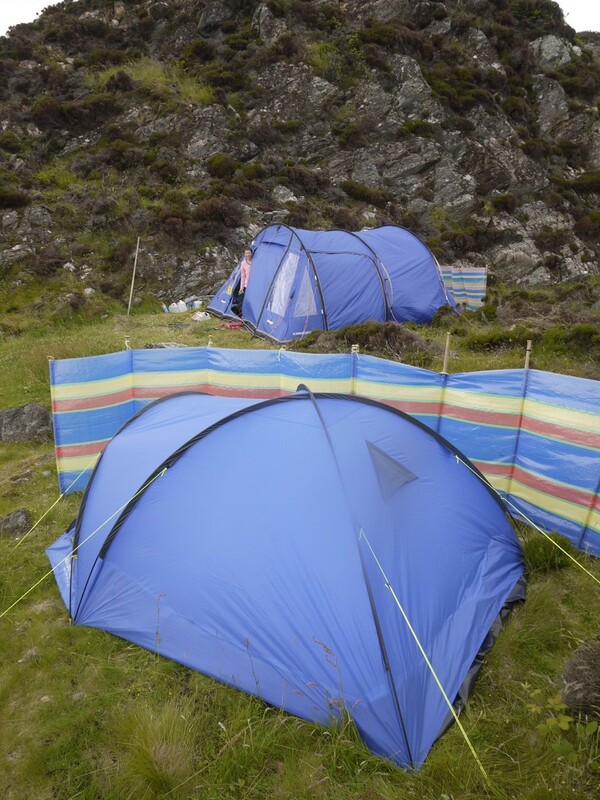 The tent is still standing (Not impressed with the Vango 600, we will be in touch with the makers!!!!!). Saturday morning I shot out in a brief dry spell to help strengthen the tent. We had half an hour of tide so speed was of the essence. I found Claire in good form but looking for sun. Next week the forecast looks better so here’s fingers crossed. We put some piping along and over the poles. Mike Buckley our Kayaking contact is sending over some extra poles which will be very welcome. Claire’s dogs gave me the usual welcome but quietened down quickly once they knew who was there. 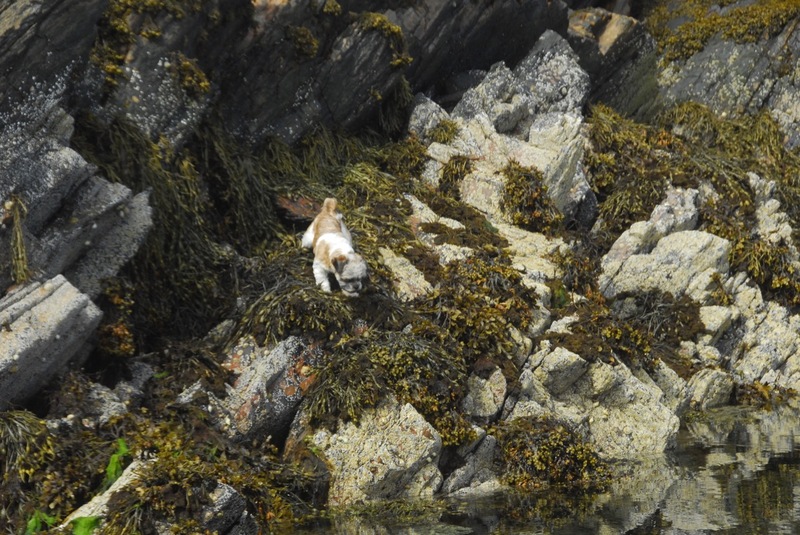 Claire reported them barking during the night, she thinks she has camped on the otters home turf as she has seen them in and out of the water. Hopefully the temporary support will save Claire having to hold onto the inside supports when the wind takes off. One of the yacht visitors was telling me that he had heard up in Badachro that Rona was really busy just now and that there was (possibly) a music festival on, lots of tents about!!!! Talk about vivid imagination……….maybe Claire’s been playing her radio too loud! Thank goodness for duck tape!! We repaired the poles by strapping her spare poles to them but we will monitor the weather and if need be I’ll get some blue plastic water pipe out to Claire which I think will strengthen the uprights. Half an hours help and I left her to it to continue the repair, she is quite capable and her pulled muscle seemed to have gone away so she is much more mobile. Claire had put up her emergency tent since I last saw her so she was not sleeping out!!! But it is quite unbelievable to have such strong wind at this time of year. We have just had a call from her on the VHF at 9pm and all is well so we will keep in touch at this time and await further developments, she reports lots of people coming and going (which is Rona at this time) and they are now giving her a wave, next project is to get some donations out of the waving sailors. 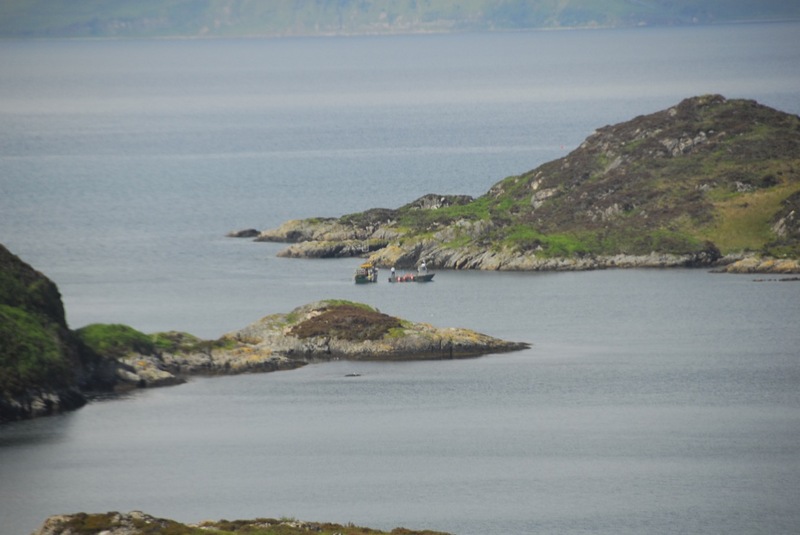 Steve and his wife gave us a wave as they passed en passage this morning to Portree. 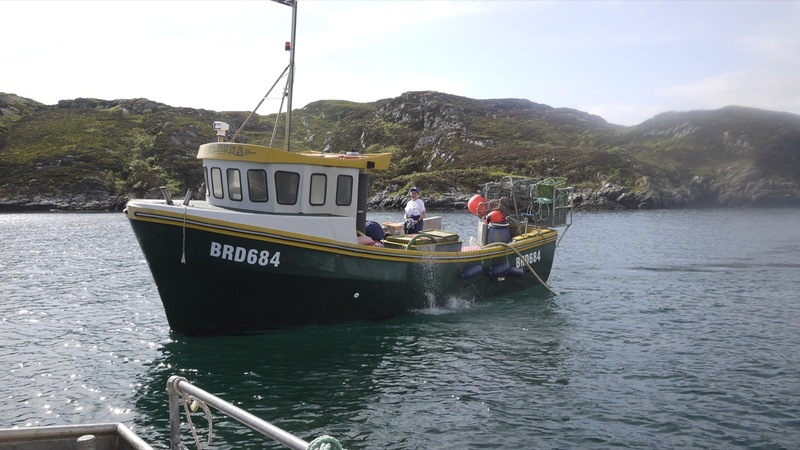 we have not had many local boats this year, they had come down from Ullapool, maybe we will get an Indian summer, I guess Claire has her fingers crossed for one now. Called on Claire for the first time yesterday at the full tide (the only realistic time to land). I had some flares, water and VHF instructions to hand over.We did not have much time the day before as the tide was on the turn. There was no need for the water as the rain had been filling her buckets!! The set up look impressive and Claire reports no midgies in the tent, very comfortable site and ‘very peaceful’ in fact I felt we were invading!!!!!! I had Fay and her kids out fishing, they are on their annual trip to Escape cottage to escape iphones, iPads and telly. They were impressed with Claire’s project. We had a brief chat with her and can only report a very relaxed Claire with unfortunately a pulled muscle after lugging all her equipment over some tough terrain. She said after all the excitement of putting the project together she felt pretty tired and was enjoying the isolation. We will be fishing on Thursday so will get a chance to give her a shout then but I think she is very happy with her Island retreat. More soon and she says thank you to her Facebook friends and messages of support. 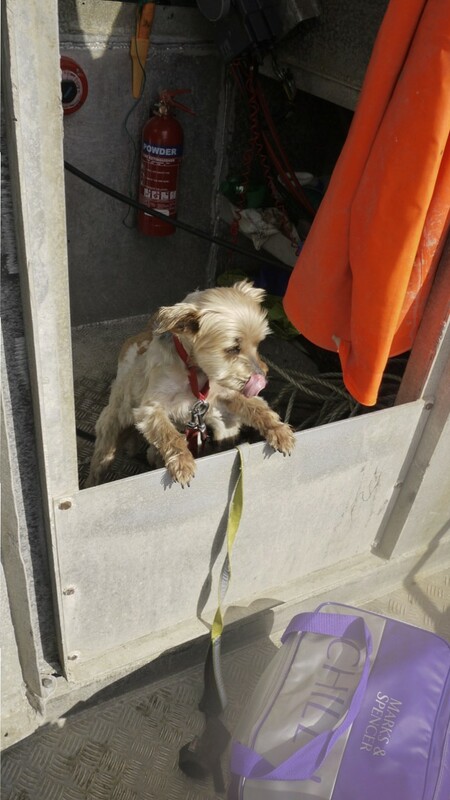 First thing to-day Monday the 6th of July, Claire arrived via Ali MacLeod’s fishing boat, Ventura. They had a lovely trip over and it was pretty calm at the full tide for the changeover. 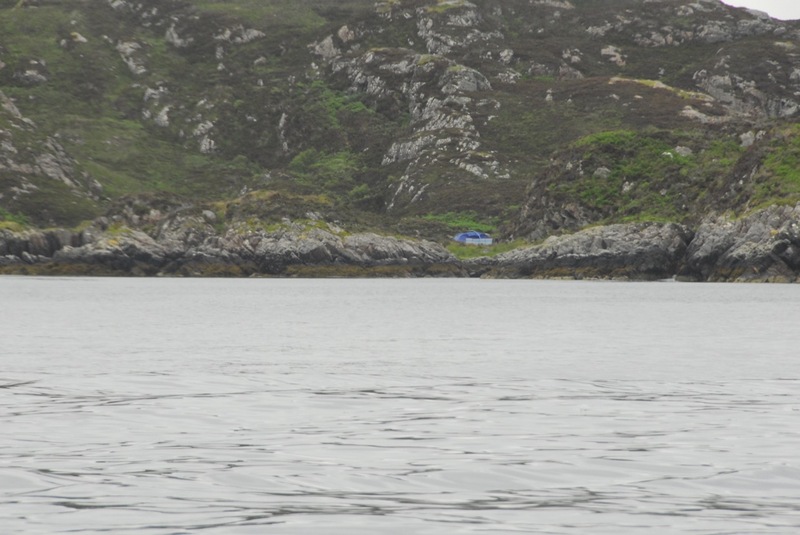 Ali was better staying off to watch us and letting the Rona boat land (it bounces better off the sharp rocks!!). 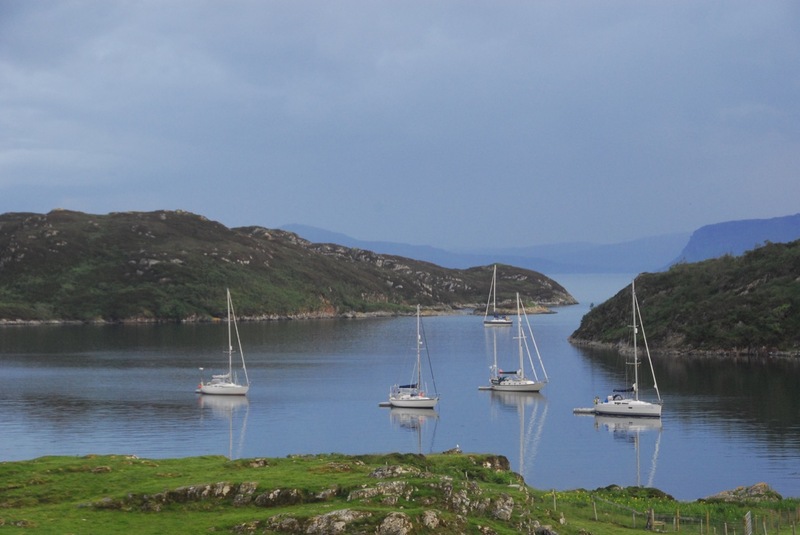 We had quite a few yachts in last night so there was going to be traffic but nothing to the M8 on a Monday morning. 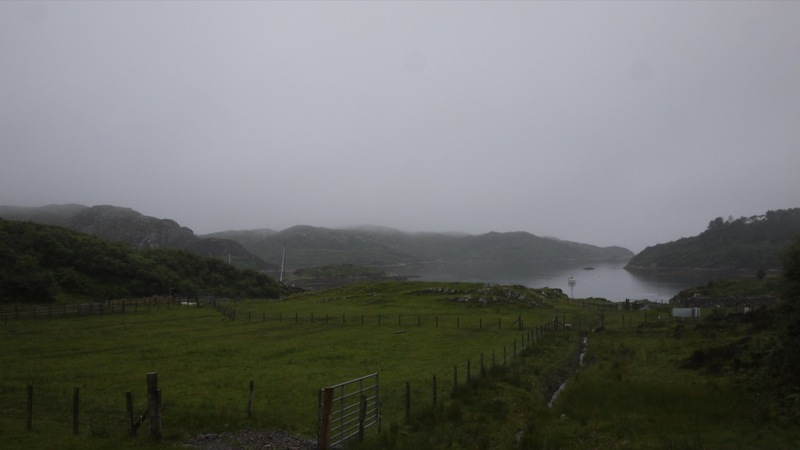 First thing this morning it looked pretty serene on Eilean Garbh, I was a wee bit jealous at the thought of perfect peace for a month. Ali Pointing Out The ‘Stuff’ For a Month. Claire had plenty ‘stuff’ with her and even the porta potti, well I guess needs must! After a few minutes all was aboard and we were off, Claire was just about there after weeks of planning and getting things together. The tide was just at the top so we had to be quick. The landing was the best we could find but served the purpose with no mishaps just the porta potti. Claire’s only company are her two dogs but I guess she may have plenty visitors from the yachts. The forecast is reasonable and going by the equipment she is well sorted. I don’t know if the M&S bag has the dogs food but the doggy was keeping a close eye on it. 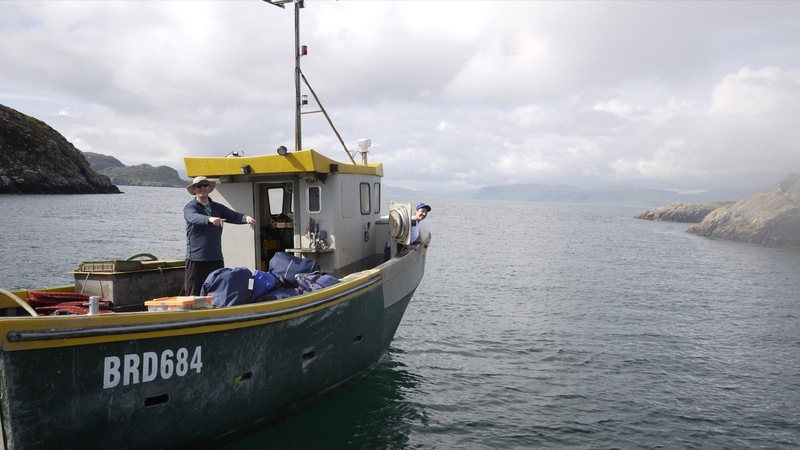 All to soon Ali was off and heading back to Applecross lifting some creels on the way. 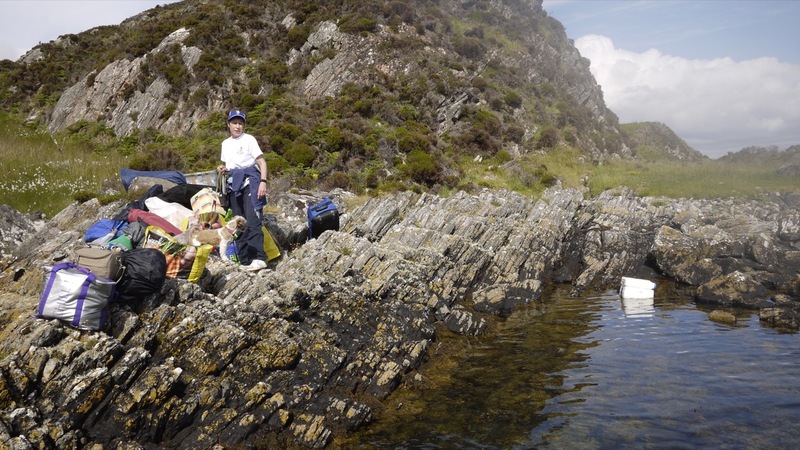 He took plenty photos, it is always well worth having a look at his blog Applecross Life . I left Claire to it, we will drop off some water and a firebeater tonight, see how she is getting on and that will be about it. Good Luck and fingers crossed for a good month. There are more links below with information on Claire’s challenge. We get a lot of email requests but when Claire Calder’s email dropped into our mailbox we were quite surprised to read it. It certainly was one of the more unusual requests. 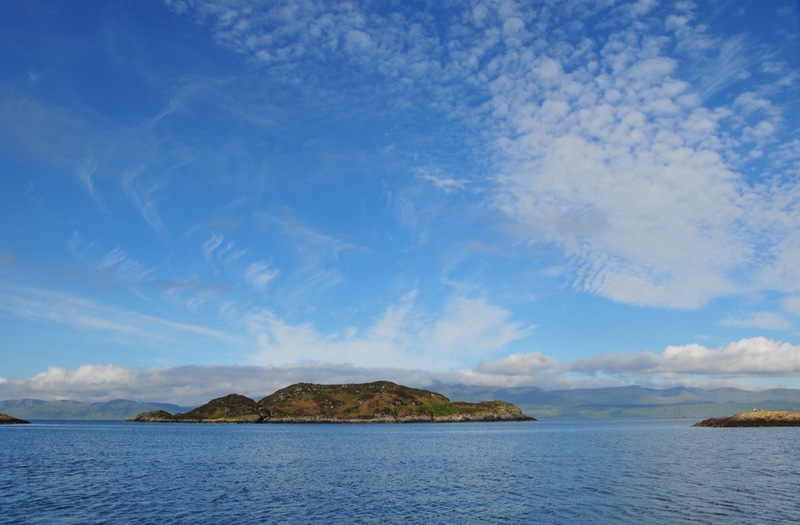 She wondered if it would be possible to become a castaway on one of the small Islands around Rona. 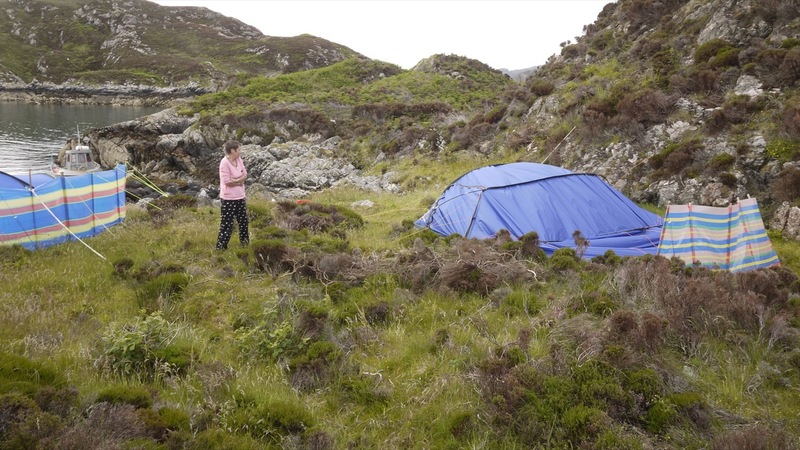 The plan was to spend an entire month on her own, camping with no one for company just her two ‘wee’ dogs. She would take all her equipment and stores, supplement it (hopefully) with what nature provides on or off the shore of this small island. The reason, to raise money for her chosen charity. 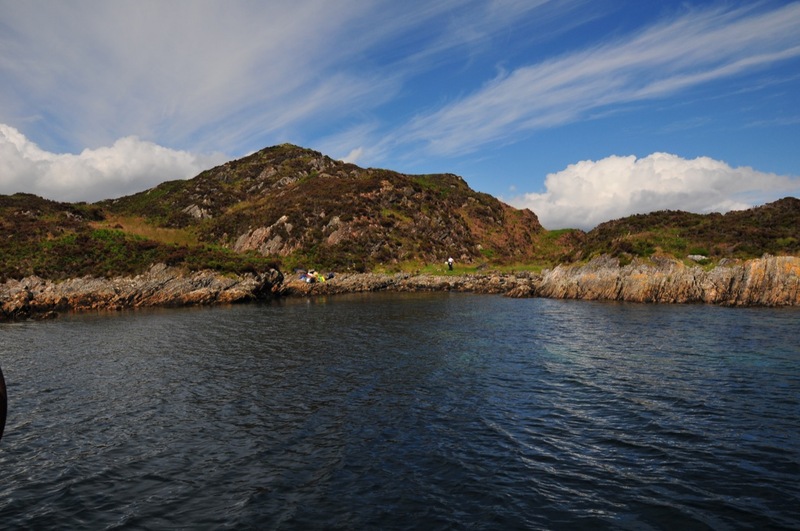 In 2002 Claire’s 8 year old daughter suffered severe burns during a camping holiday. It was her first holiday away from home. The Scottish Burned Children’s Charity Theburnsclub.org supported Claire and her daughter during this time. 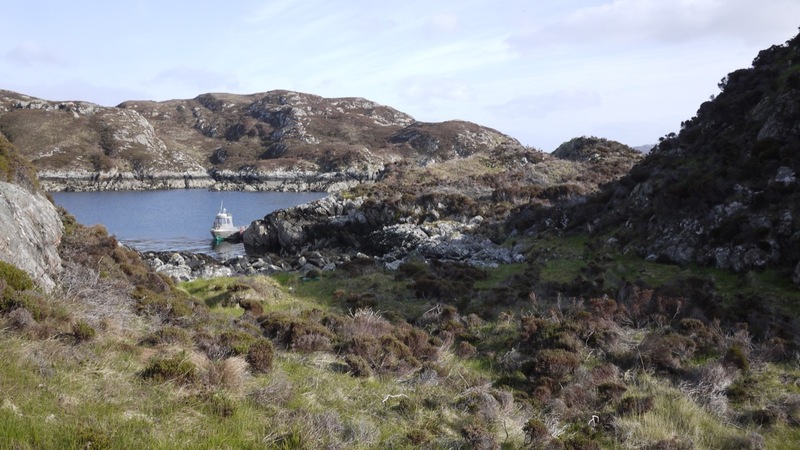 So, to raise awareness for this charity and to raise funds, Claire is hoping to survive for one month on this wee Island ‘Garbh Eilean’ at the mouth of our harbour (Acarseid Mhor) with her two dogs for company. I’m sure there will be plenty wildlife to keep her company and many passing yachts, boats, kayaks and who knows what to pass the day. The proposed campsite above, there is a green patch, nice and flat and sheltered from the SW wind, which we get plenty of for sure!!! And to get away from the midge, the hill behind will be ideal to sit up in the breeze, which we get (most of the time). We will endeavour to put a few posts together during Claire’s stay and hopefully this awful weather will improve for her kick off day which we have set at the 6th of July. If you have Facebook then click on this link for more information. Claire Calder on Facebook. So far there has been quite a bit of interest with the local press featuring Claire’s Challenge. West Highland Free Press-Claire . Good Luck Claire, we look forward to having a Castaway. 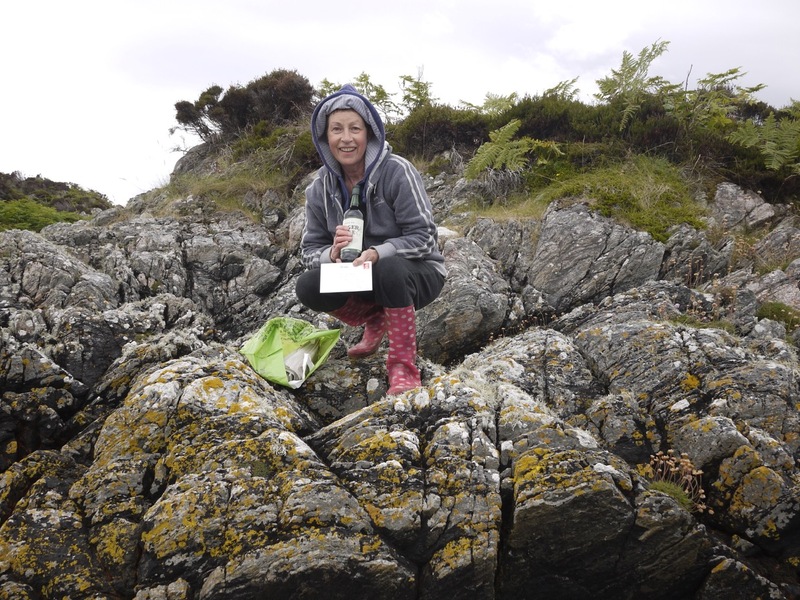 Great to hear that Claire got onto the island ok…with your kind help. She’s a brave but determined lady! We hope to get over to see her towards the end of her month (when our boat is back from Kishorn!). Keep us posted when you can Bill. Thanks. Thanks for the update Bill. Glad she’s in good spirits and not deterred by Tuesday’s gales! Fingers crossed for better weather. Hopefully Mike can get the new poles over soon (he’s also a friend of mine!!). Thanks again for the update, Bill. 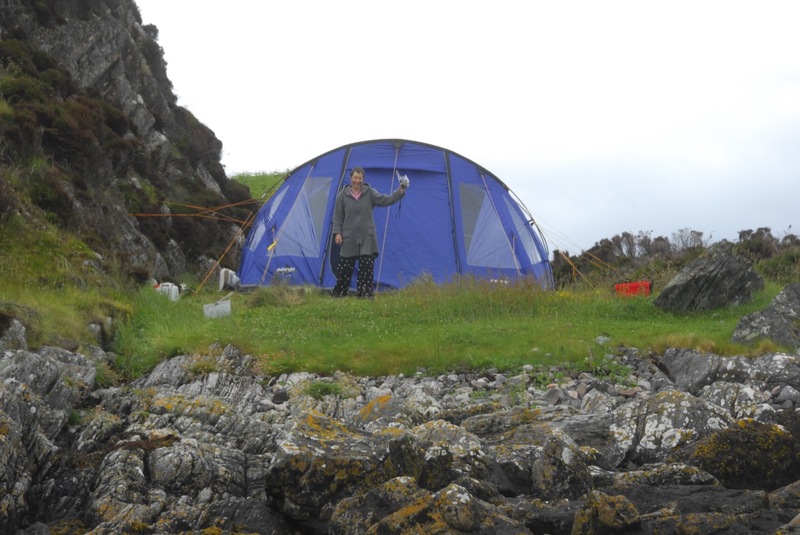 Good to know she’s doing well, thinking of her just now as I listen to the wind, hope the tent poles hold out! 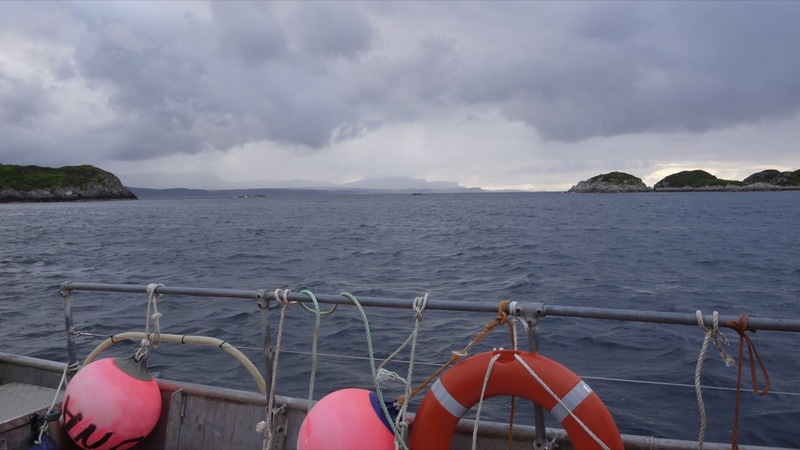 We made it back to Applecross in good time despite the swell. Ali was looking a bit tired, bless him. Had help unloading from a few, very kind volunteers. Then my car would not start !!! Soon fixed with the jump leads. Very midgey at the pontoon. Petrol tank on warning light but made it back to the campsite on a wing and a prayer. It’s nearly 1am and I have just finished reading the blog. Thank you SO very much …………. it is amazing and a very accurate record. Bill is the only person I know who can make an old biddy look reasonable in a photo !!! Thank you for all your kindnesses, time, patience and most importantly, for believing in me and giving me the chance to fulfill my dream. Despite the weather I had an amazing time; a life changing time in fact. It was made all the more bearable by your support and concern. Bill is the same age as me but I am very envious that he still has the energy that I can only recall in a dim and distant past !! I had a lovely night in the Bothy and have left you a note in the visitor’s book. Please accept the donation as I bought lots of your postcards also. I enjoyed meeting your friends and please thank them for their help and support. Rona is a world within a world; quite unique and utterly spectacular. I envy you being it’s custodians but I can only guess at how much hard work it involves. If you ever want someone over to help with stick gathering, pruning etc, give me a shout ! Please also pass my thanks to the Jensons for allowing me to stay on their beautiful island. I should be more than happy to share my experience. I am also on facebook. I hope to have some of my photos online soon. To those of you who have given their time, energy, friendship, support and advice to making this castaway a success….. I thank you all and could not have done it without you. Now I am starting to ‘roll’ (the effect of the swell in the Inner Sound and NOT the ginger wine !!) so must off to my bed.